Sixteen year-old Cheyenne Wilder is asleep in the back of a car while her mom fills her prescription at the pharmacy. Before Cheyenne realizes what's happening, their car is being stolen—with her inside! Griffin hadn’t meant to kidnap Cheyenne, all he wanted to do was steal a car to impress his low-life dad. But once Griffin's dad finds out that Cheyenne’s father is the president of a powerful corporation, everything changes—now there’s a reason to keep her. Cheyenne is not only sick with pneumonia, she is also blind. Can Cheyenne survive this nightmare—and at what price? Very interesting...do you know when it is coming out? 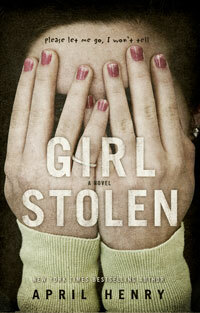 I really enjoyed Girl, Stolen!! Oooo, I like the sound of Girl Stolen. I'm putting it on my list now! I would recommend this book to all young adults because it is a simple fiction book with a with a crazy twist. I liked it so much because the young girl, Cheyenne, conquered diversities and all sorts of challenges that come with being blind.